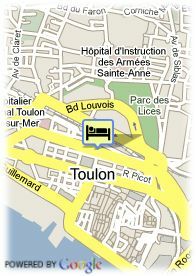 7 bis Rue de Chabannes, 83000 Toulon, France. 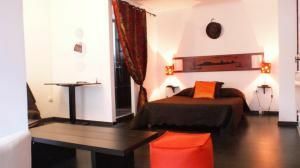 In the heart of the centre of Toulon, 300 m from the train station, on the magnific 'place de la Liberté', all the team of Celenya Hotel will have the pleasure to welcome you in one of the 29 rooms. All the rooms are equipped with bath or shower, telephone, televisions, hair dryer, and some with air conditioning. Decorated around the theme of the 5 continents, you will be in different universe. You will be in Africa, Asia, Oceania, Europe, or Americas…. In the lounge, you can relax with a cup of coffee, or use our Wifi internet access. With its central location, you will be at the starting point for many excursions, close to the pedestrian streets with shops, good restaurants… The hotel is also just near Toulon Train station, and Zenith Omega where are given a lot of concert. You will also be able to go to the harbour, where you can take a boat to visit isles, and discover our sandy beaches (Tamaris, Sablettes). We will have a pleasure of guiding you during all your stay. Near trainstation, Centre, Harbour, Museum Area, Near highway, Near the historic centre. With its central location, you will be at the starting point for many excursions, close to the pedestrian streets with shops, good restaurants…The hotel is also just near Toulon Train station, and Zenith Omega where are given a lot of concert.